To the list of things Under The Dome has borrowed from Lost, we can add one more: daddy issues. At least, that's the case in tonight's episode, "Thicker Than Water" (the title of which counts as a spoiler, if you think about it), in which Junior's Oedipal complex gets kicked up a notch by the ongoing power struggle between Big Jim and Farmer Ollie. Yes, it's another episode with far too much emphasis on Junior, but a generally entertaining hour nonetheless—albeit one generously salted with the usual annoyances we've come to expect from this show. By the end of the episode, it's clear that the purpose of this whole Big Jim/Ollie kerfuffle is actually to set up another power struggle entirely, between Big Jim and Barbie. Which is fine, but would be even better if Mike Vogel brought a little more to the table as Barbie, a character who instantly vanishes from my mind the second he's offscreen. At this point, anyway, he and Dean Norris are sorely mismatched. The writers have to share the blame here, as Barbie's characterization to date has been tissue-thin, but it certainly wouldn't hurt if Vogel were just a little more dynamic in the role. The other narrative purpose to this storyline (besides the whole "needing water to live" thing) is to flesh out the Big Jim/Junior relationship. Ollie informs Junior that his mother, who died in a car crash, actually committed suicide, something Big Jim has concealed from him all his life. Junior decides to kill his Dad (or maybe he was just pretending, if you choose to believe his "Trojan horse" explanation), but when Big Jim breaks down weeping, blood indeed proves thicker than water. This scene could have been a complete eye-roller, but Norris really sells it; this makes two nights in a row he's delivered the goods, following the Breaking Bad premiere (where he has a slightly higher grade of material to work with). Meanwhile, back at the hatch… er, sorry, Electric Pink Easter Egg, Julia gets in on the secret of the mini-dome thanks to Joe's slip of the tongue. (And boy, did that land with a clunk.) We don't really learn anything we didn't already find out last week, except that "the monarch will be crowned." That's a phrase that might put rabid Stephen King readers in mind of the Dark Tower and the Crimson King, but here it appears to be a reference to Angie's butterfly tattoo. So either Angie is some sort of Chosen One, or the dome was actually built by giant butterflies from outer space. Those are my two guesses at this time. 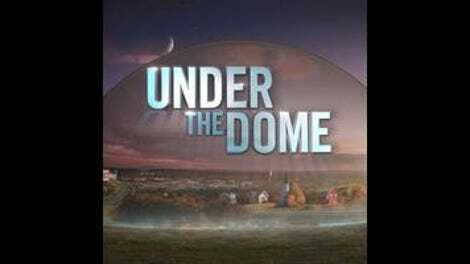 For the most part, this felt like a solid if unspectacular example of what Under The Dome can do well. As opposed to some of the manufactured dilemmas of the week we've seen in the past, the standoff at the well was reasonably exciting and grounded in the premise of the show, with the residents of Chester's Mill finally seeming to realize the dome isn't coming down anytime soon and acting accordingly. The stakes were appropriately high… and my appropriately low expectations were met. The first 30 seconds of this episode could have been the next episode of Breaking Bad: Dean Norris hears an intruder, gets out of bed, grabs his gun… but no, it's not Heisenberg. Only Junior. RIP Ollie. You were an oily villain indeed. "Well, that's something you could have mentioned, Joe."